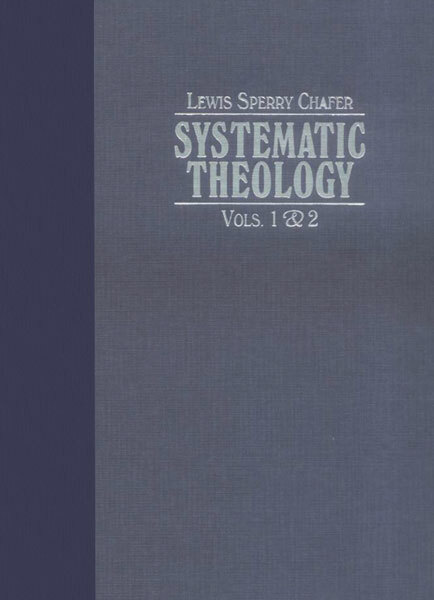 Lewis Sperry Chafer defined systematic theology as "the collecting, systematically arranging, comparing, exhibiting and defending of all facts concerning God and His works from any and every source." He outlines the topics he feels should be included in a comprehensive and unabridged systematic theology: bibliology (a theology of the Scriptures), theology proper (God), angelology (angels unfallen and fallen), anthropology (a doctrine of humankind), soteriology (doctrine of sin and salvation), ecclesiology (doctrine of the church), and eschatology (a doctrine of things to come). Chafer’s Systematic Theology includes theological viewpoints originally popularized in the Bible conferences and the Scofield Reference Bible, making this work “the first dispensational premillenial systematic theology ever published,” following the dispensationalism of Cyrus Scofield and the Scofield Reference Bible. Reformed in his theological orientation, Chafer demonstrates his moderate Calvinism in his discussion of the decrees of God, predestination, and the atonement. His position on the inspiration and authority of Scripture follows the fundamentalist movement in general. Chafer’s Systematic Theology, originally published in 8 volumes, often packaged as 4, is now available in its entire, unabridged form, for your mobile device. Lewis Sperry Chafer (1871-1952) was ordained as a minister in 1900 and was mentored by Cyrus Scofield. In 1924, he founded Dallas Theological Seminary, and is considered one of the founders of modern dispensationalism. Author of hundreds of theological articles and many books, Systematic Theology is Chafer’s most comprehensive and popular work.